Rick Lowe, professor of interdisciplinary practice in the University of Houston Kathrine G. McGovern College of the Arts, has been selected as the 2019 State 3D Artist by the Texas Commission on the Arts. Rick Lowe, professor of interdisciplinary practice in the University of Houston Kathrine G. McGovern College of the Arts (KGMCA), has been selected as the 2019 State 3D Artist by the Texas Commission on the Arts (TCA), and will be formally announced by the Texas Legislature on March 25. Appointees are selected for one-year appointments and represent the best of Texas' rich and diverse artistic community. The award is the state's highest recognition for excellence in the arts. "This latest honor further cements UH's position as a University embedded within its community" said Paula Myrick Short, UH senior vice president for academic affairs and provost. 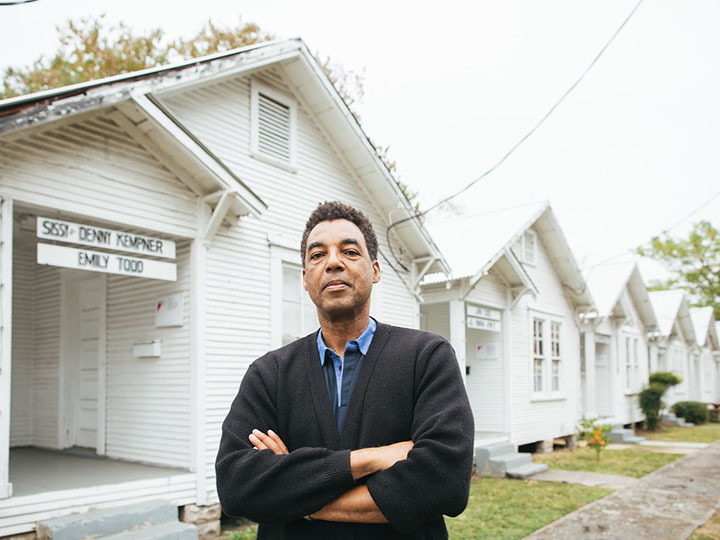 "Rick Lowe's social activism has transformed the city of Houston, and he contributes to KGMCA's mission to provide the artists of tomorrow with core faculty who are leaders in their field." Rick Lowe joined the UH faculty in 2016 and immediately began initiating KGMCA partnerships and programs in the field of socially engaged art. Lowe has described his own work as "social sculpture," which makes his appointment as the State's 3D artist a fitting one. He is well-known for his work on Project Row Houses, a series of shotgun-style homes that act as exhibition venues, studio spaces and as a social center for the surrounding community.